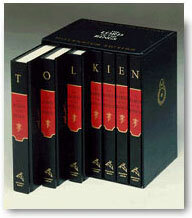 In England, in January 1997, The Lord of the Rings won the Waterstones poll as the Book of the Century. (For those who dont know, Waterstones is large bookstore chain in England.) This result was alternately hailed or derided. The English literati squealed in horror at the result, but many readers welcomed it. A few months later, a poll by the Folio Society (also in England) got the same result. Across the Atlantic, in July 1998, the Editorial Board of the Modern Library unveiled what it called the 100 Best Novels in English of the Twentieth Century, and The Lord of the Rings didn't even make the list. Many howled at both the selections chosen, and the omissions, for the list is decidedly of the snobby New York type. And then in 1999, the online bookseller Amazon.com did its own poll, and The Lord of the Rings came in first again. What (if anything) can we learn from these polls and lists? That "lists" themselves are suspect, conveying the hidden prejudices of the compilers; that polls and lists are virtually meaningless, depending upon who draws up the lists or who participates in the polls; that lists and polls are as much about exclusion as they are about inclusion; that they stir up extreme reactions, leaving people to argue about what to read instead of just reading. If you dont, then you boo! Meanwhile, despite various literary critics barking to themselves from their high towers, Tolkiens books are selling better than ever. More and more new readers come to Tolkien and learn for themselves the various joys found in his writings-- joys ranging from simple ones (at times) to vastly erudite ones (at other times). Here, I know that Im writing for the converted. Most people who come to TheOneRing.net are already in the know about Tolkien. So lets talk here about one the recent editions of The Lord of the Ringsin particular this so-called Millennium Edition. The books in the Millennium Edition are small hardcovers, about the size of regular mass market paperbacks. They do not have dust-wrappers, and all seven volumes come in a sturdy slipcase. The maps are mostly found at the end of the Appendices book (redrawn very nicely by Stephen Raw; these have appeared in previous editions), though the Shire Map still appears in its usual place just before chapter one in the first book. All in all, the Millennium Edition of The Lord of the Rings is very nice set to own. Collectors might prefer the larger hardcovers, and some might prefer an illustrated edition, like the very nice hardcover with fifty full color plates by Alan Lee (I love this one! It came out in 1991, and is still available (Houghton Mifflin, $70.00, 0-395-59511-8). But the Millennium Edition is a very nice set for reading and quick reference. Some (like myself, I confess) will never been happy with only three, six or ten editions of The Lord of the Rings, but Im pleased to mark the new Millennium by the addition of this special edition to my bookshelf. Meanwhile, the critical pendulum will swing, and one poll or list will give way to another. I like these lists as much as anyone, but I cant take them very seriously. Is The Lord of the Rings the "Book of the Century," or even the "Book of the Millennium"? To be honest, I dont really care about the answer to such a question. Im just glad its here, to read and re-read, to pass on to friends and to family, from one generation to the next. And that progression will last a lot longer than these various lists.